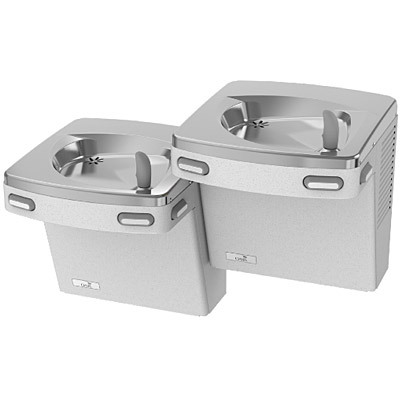 The Oasis PF8ACSL Water Cooler shall deliver 8.0 gph of 50°F degree water at 90°F ambient and 80°F inlet water. Shall have VersaFilter® system for taste, odor and chlorine reduction, lead reduction and cyst reduction. VersaFilter system shall comply with NSF standards 42 and 53. Models PF8ACSL and PFACSL shall include front and side push pads to activate the flow of water. Basin shall be designed to eliminate splashing and standing water. Bubbler shall have flexible guard and operate between 20 and 120 psi. Cabinet finish shall be Sandstone or Greystone powder coated paint on galvanized steel or brushed stainless steel. As a standard feature, the bubbler and push pads contain an antimicrobial silver additive (AlphaSan®) that inhibits the growth of bacteria, fungus, mold and mildew. The front nose of powder coated models also contains the antimicrobial additive in the powder coating. Cooling system shall use R-134a refrigerant. Shall comply with ANSI A117.1 and ADA. Shall comply with ANSI A117.1 and ADA. Shall be listed by Underwriters' Laboratories to U.S. and Canadian standards. Shall comply with ANSI/NSF 61.